The worldwide success of George Romero's masterpiece Dawn of the Dead led to an incredible boom in Italy for anything involving zombies. 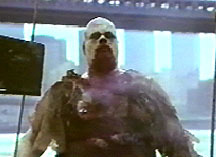 Director Lucio Fulci, already known for the unrepentant gore in his movies, was one of the first to jump on the bandwagon with 1979's Zombie. 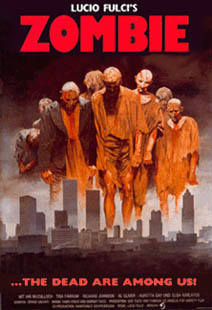 Fulci titled his film Zombie 2 for European audiences to give the impression it was a sequel to Dawn of the Dead, which was called Zombie overseas. This was a disservice, as the picture perfectly stands on its own, a visceral and grisly delight. The action begins with a man shooting a corpse in the head. He says, "The boat can leave now...tell the crew." When that sea vessel arrives in New York harbor, there appears to be no one in it. A police chopper above radios the coast guard men on a nearby patrol boat. The two officers try to get someone's attention on the vessel. When nobody responds, they head over to see what's happened. One of them finds food strewn about and comes upon a severed hand. Suddenly, a huge grotesque and decaying figure lunges and pins him to the floor. The officers grabs at him but only succeeds in taking a piece of skin off. The zombie bites into the cop's neck and blood spurts all over the place. The ghoul then goes up on deck...where the second officer sees him and tells him to freeze. 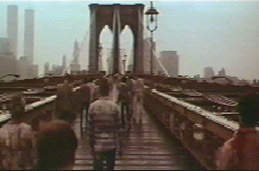 He doesn't - and the cop shoots several times, sending the zombie's body into the river below. A newspaper reporter named Peter West (Ian McCulloch) is assigned to the case. The boat owner's daughter Ann Bowles (Tisa Farrow) has arrived at the scene. She hasn't spoken to her father in three months and neither she nor the detectives know where he is. That night, Ann decides to go back to the boat and runs into Peter, who has been following her around. The two of them have snuck by a cop who is keeping an eye on the crime location. As Peter and Ann are about to be busted, they pretend they're lovers in an intimate exchange. The officer falls for the ruse but throws them out. However, Peter has found what he was looking for: a note to Ann from her father explaining his whereabouts. In it, he tells her he's contracted a strange disease on the island he has been conducting studies on. Peter informs his boss that he and Ann are heading out to the island of Matool. Their plane lands in the Caribbean and the two hitch a ride on the yacht of a couple they meet. Although Susan Barrett (Auretta Gay) and Bryan Hull (Al Cliver) warn them the island is cursed, they agree to take them. On Matoul, Dr. David Mernard (Richard Johnson) is trying to comfort his distraught wife Paola (Olga Karlatos). She's upset about her husband's experiments on the natives, who are mysteriously dying. Paola is also frightened by rituals involving the supernatural that have led to the rise of zombies at the other end of the island. After an argument, Dr. Mernard assures his wife that they'll leave after more research into the phenomenon is finished. In the meantime, he draws his own blood to test for the virus that is rapidly spreading. Back on the yacht, Susan decides to go scuba diving, unaware that a shark is is in the area. She catches a glimpse of it and tries to get away. When she calls for help, Bryan fires off some shots from his rifle. 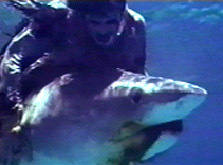 Susan swims back down below to hide and is grabbed by an underwater zombie. She breaks free and the zombie and shark struggle for dominance. While Dr. Mernard is tending to the sick at a makeshift clinic with his nurse (Stefania D'Amario), Paola is alone in their house. Already on edge, she hears someone lurking outside. As she tries to lock one of the doors, a very determined zombie tries to push his way into her home. It grabs her by the hair through a broken window shutter. Paola is pulled towards the ghoul...and her eye is impaled on a large splinter of wood as she screams in agony. Dr. Mernard tends to a sick friend, who tells him the zombies are headed towards that part of the island...while Ann and Peter (along with Bryan and Susan) check up on Paola. They stumble on a horrible sight...zombies eating her corpse. The group leaves immediately for the clinic. Their jeep crashes and Peter is injured. Forced to walk, they end up in a cemetery for Spanish conquistadors. The undead begin to come out from under the earth and one of them takes a huge chunk out of Susan's neck. Ann, Peter, and Bryan make it to Dr. Mernard's clinic and the doctor tends to Peter's wound. Bryan tries to seal the doors as hordes of zombies descend on them. The undead successfully make their way in and Dr. Mernard gets bitten in the face. Bryan shoots the zombie but it's too late to save the doctor. Dead patients start to come to life and the nurse is killed. Bryan, Peter, and Ann try to keep them away with explosives and firearms...and soon the entire building is ablaze. Outside, Bryan sees Susan, who has now fully transformed into a zombie. Before he can react, she bites a piece of his arm off and Peter shoots her in the head. The next morning, Bryan dies on the yacht. 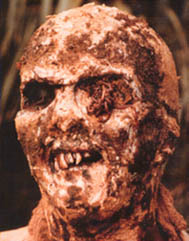 Lucio Fulci's confident direction and the fantastic makeup and special effects make Zombie a must-see. The makeup was done by Giannetto De Rossi and Maurizio Trani. The special effects were also created by Rossi, along with Giovanni Corridori and Gino De Rossi. The underwater zombie sequence with a shark is just weird icing on the cake. Ignore the poor character development, sit back and enjoy this fun gorefest. While not on par with Dawn of the Dead, it is a fun variation on the theme and a worthy companion to Romero's trailblazer.